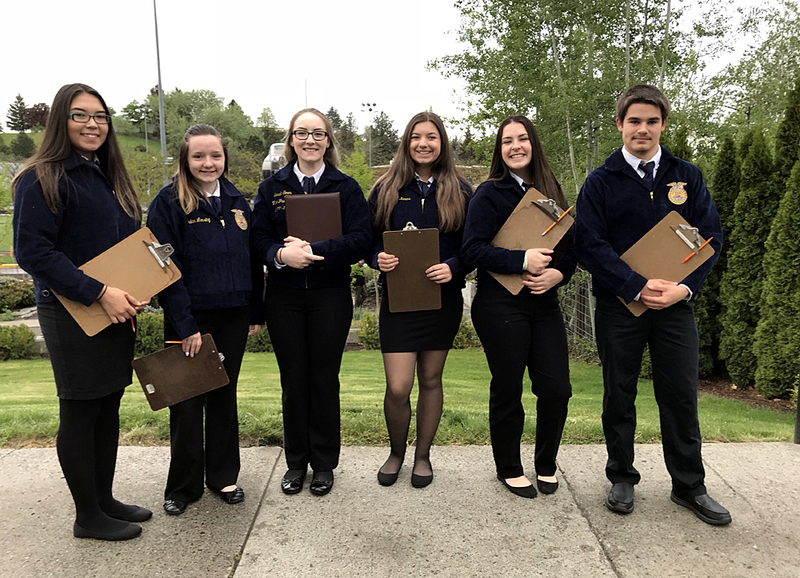 This past week six members from the Morton FFA Chapter competed at the 88th Annual Washington State FFA Convention at Washington State University in Pullman, Washington (May 10-12). Kenna Lewis, Jacob McLynne, Jordan Lansing, Shelby Karns, and Terri Richards competed in the Food Science CDE (Career Development Event), which involves Food Safety and Sanitation procedures, as well as food processing components. Sarah Smith represented Morton well in the Employment Skills (formerly Job Interview) LDE (Leadership Development Event), which includes a live personal interview as well as a formal resume, cover letter, and follow up letter. Smith, McLynne, Lansing, Karns, and Richards presented their FARM for Kids lesson which they taught at Morton Elementary School this spring. The FARM for Kids event focuses on community outreach and agricultural awareness. Students taught seventh graders in Ms. Moeller's second grade class all about the importance of Honeybees in Agriculture. While at convention, students also had the opportunity to take advantage of several tours around the WSU campus and surrounding areas. Students visited the University of Idaho campus in Moscow, Idaho and learned all about the programs offered there. Students also toured the Knott Dairy Farm, at WSU which supplies Ferdinand's Creamery on campus which makes the famous Cougar Gold Cheese. Students also toured the Conner Museum on campus which features taxidermy mounts of animals from around the world.